An update for ZSE investment application ZimStocks has been released with a set of new features that were largely influenced by feedback from the users. More importantly the ZimStocks team has introduced a subscription model to start generating revenue through the app. Membership gives access to the app’s features like Home, Portfolio, Watchlist, Alerts, Stock Insights.This membership is free for the first 30 days after registration but if you have an existing account you’ll receive an extra month free. Monthly subscription after that will set you back $3.90. Payment can be made via credit or debit card, PayPal,EcoCash, TeleCash and ZimSwitch Payments. This latest version (8.0 for Android) has already been released on the Google Play Store while the version 1.3.0 for iOS. will be made available around the 8th of Sept 2014. 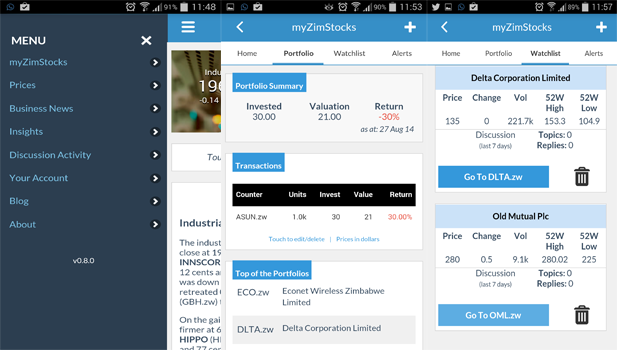 Changes made to the app include a simpler menu and the introduction of a new integrated section called myZimStocks. This section offers a Home section which brings insights into counters(mostly price fluctuations) that the user interacts with frequently either through their portfolio or through discussions. The myZimStocks feature has a Watchlist tab that monitors up to five counters of the user’s choice. This is ideal for monitoring the share price of a counter you might be keen on adding to your portfolio in the future. Also part of the myZimStocks feature are the Price Alerts and Portfolio Alerts which help notify the user of stock price or portfolio rises or falls beyond specified limits. Other changes to the app include a message feature for responses made to any discussion you’re involved in. To the credit of the ZimStocks team they took time to refine their app and have released updates that factored in feedback from the its users. Monetisation has come after a thorough appreciation of what the market appreciates about the app in addition to traction in terms of sign ups on both iOS and Android. Monthly subs at $3.90 really does not make sense considering that the ZSE has one trading session and generally considering that free information in terms of prices starts trickling in around lunch time to the general public. A once off purchase price for the app would actually make sense. Just to add a bit more clarity, publicly available data (closing prices, commentary plus some of our analysis) remains FREE on ZimStocks. It is important to recognise that the value added features on the platform turn reported data into information and then into insights. Where the rubber meets the road is a self evaluation of whether a dollar value for 30 minutes of your time (time saved) is less than than $0.19 a day (subscription). Can one buy stocks on the app or its just for information and updates on market ? Boring, when you give us HFT on ZSE, then tell us what you got.